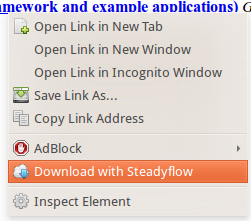 This is an extension for Chromium/Google Chrome that adds a "download with Steadyflow" context menu option to links.To download a file with Steadyflow, right-click its link, then choose "Download with Steadyflow". What does Steadyflow do? And why do I need it?